This beautiful Valentine’s day card is perfect for you to celebrate Valentine’s day. 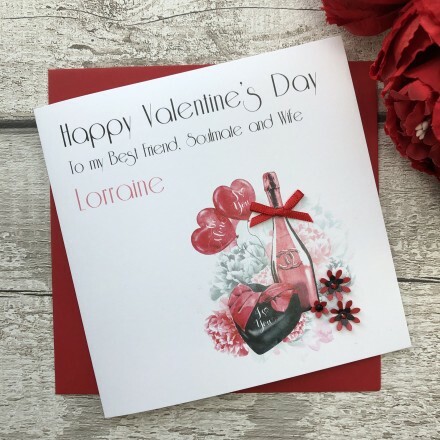 A gorgeously handcrafted Valentine’s card that features an image of a bottle of Champagne, heart balloons and chocolates. This card is finished with glittering red flowers and a hand tied red bow. This personalised Valentine’s card would be quite special to receive. You can customise this card on the front and insert both left and right, to make this handmade Valentine’s card extra special. Valentine’s Day cards can be personalised as Wife valentines cards; Girlfriend & Fiancée valentines cards, husband valentines cards etc. Making your Pink and Posh card a Valentine’s card to be cherished for years to come. Order a beautiful Valentine’s card online today. Our Valentine’s card collection has been made with love and designed with thought in the UK by us. Our handmade Valentine’s cards are posted to you in an individual clear cellophane sleeve in a double cardboard envelope or box for protection during shipping. A separate red envelope is also included with our cards for you to present the card to your sweetheart.